Ask any expert to name their leading heavyweight prospects and there’s a good chance Hughie Fury will be mentioned somewhere among them. After all, the talented 20-year-old is unbeaten in 15 professional fights and has barely lost a round since turning pro in March 2013. Cousin of Tyson, son of Peter, young Hughie Lewis has taken the British heavyweight division by storm while stopping eight of his defeated opponents. He stands at 6’6, weighs around 240-pounds, and possesses a surprising amount of athleticism and speed given his dimensions. Remind you of anyone? Unlike his famous cousin, though, Hughie started his pro career without a blaze of publicity or much in the way of attention. Instead, he plied his trade up and down the country, often on non-televised shows, and was kept extremely active by his father, Peter, who also trains him. This guidance and education allowed Fury to relax into the pro game and fully mature as a fighter. He beat the usual journeymen types in the opening year of his pro career, but, crucially, boxed a staggering 12 times in 2013. In this day and age, that’s frankly unheard of. Old-school, then, both in style and attitude. Unfortunately for Hughie, an untimely illness slowed his progress in 2014. Nevertheless, he still scored good wins against Matthew Greer and Danny Hughes and, with his illness now behind him, kickstarted a breakthrough 2015 with an impressive and dominant 10-round points decision victory over dangerous Ukrainian puncher Andriy Rudenko in February. Rudenko, a hard-hitting fringe contender who’d previously lost only once in 25 pro fights, failed to get to grips with Hughie’s movement and smart boxing brain and found himself trailing from the off. It marked the best performance of Fury’s career to date and set him up for more big fights later in the year. Since then, Fury has scored a shutout points win over the durable Brazilian George Arias – another fight in which he travelled ten rounds with ease – and is booked to fight on the Wladimir Klitschko vs. Tyson Fury undercard in Germany on November 28. Things are looking up for the 6’6 star. 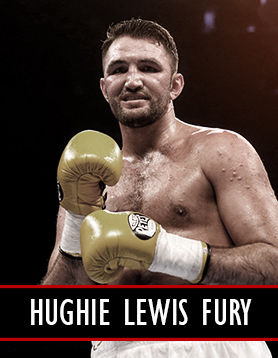 Rest assured: the heavyweight division now has two Furys to contend with.